You would not believe how dark it can get at 5am in the woods, which is when the Boulder Field 100K starts in Hickory Run State Park. We’re talking pitch black outside. It’s so dark that not only can you see the stars in the sky, but you can see the stars behind the stars. The race director had a light set up so we could see the benches for our drop bags, however it lit only a small area. About 40 runners stood around the start/finish line and we nervously chatted with each other waiting for things to get underway. Everyone walked over to the start area and it was funny that no one was actually on the start line. All the other runners were five to ten feet back and rather relaxed. I guess we all knew that we were in for a long day and a couple seconds one way or another wasn’t going to decide anything. After a short countdown by the RD, we were on our way. The race starts on a small gravel road. I had barely settled into my pace when Steven Weiss, the race director, comes flying by me. Apparently, they were missing a volunteer at the first turn about a quarter mile down so he was really moving to get down there. You make a quick left then right onto the first trail about a hundred feet up. I settled into the middle of the pack and just cruised along the single track trails. The trees and bushes were so close to the trail that there was limited opportunities to pass anyone in the first couple miles. And that’s OK as no one was in any rush. 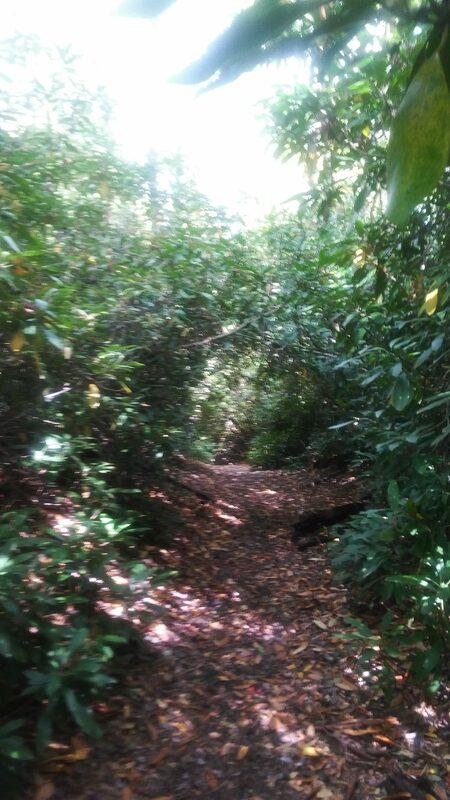 After an easy descent from the start, the trails gently sloped upward for quite a while. I started playing the “will I be able to run this section next loop” game in my head as I went along (answer: no). 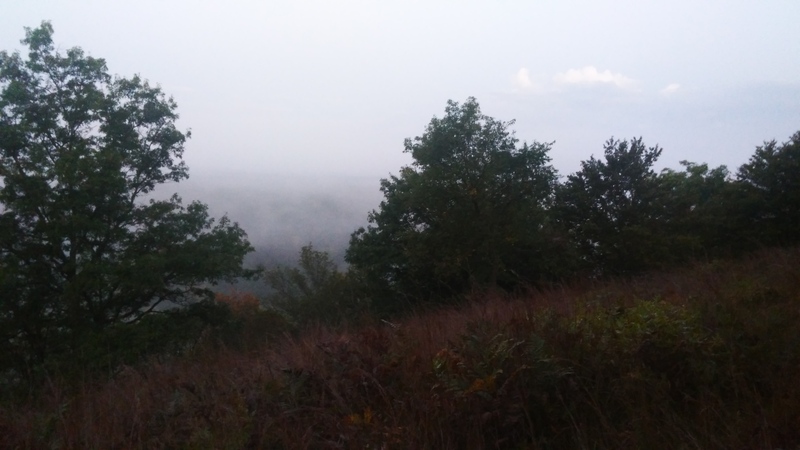 Fog down in the valley as it finally gets light out. There are two aid stations (or snack bars as my wife calls them) in the first 13 mile loop though in reality it’s just one aid station that you hit twice. The first time is about mile 5 and then again at mile 10. It was still dark as I cruised into it the first time and I could see the headlamps of other runners who where across the stream and heading the other way out of the aid station. I didn’t spend much time here as I hadn’t made much dent in either of my 20oz water bottles. About a mile further along you hit one of three hills on the course. 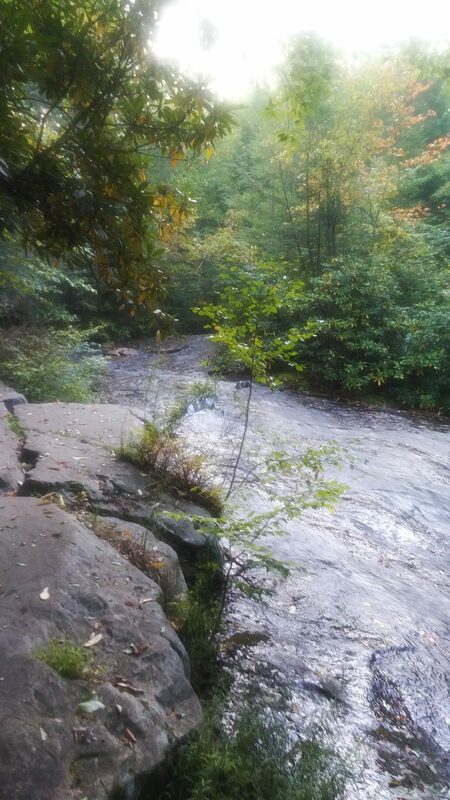 It’s the steepest one, but not too long and you should be able to get up and over without too much difficulty. It was in through here that it became light enough that I no longer needed my headlamp. There’s a steep switchback section right before the next aid station, however like the way up, it’s not too long/difficult. You ran along several streams throughout the day. I hadn’t looked too closely at the course map so wasn’t sure where I was going next. I recrossed the bridge from earlier in the day and made a left opposite the trail I came down on before. About a mile down the trail, you pop out onto a road and run by the park office. You then enter the . . . dum dum dummmmmmmmmmm. . . 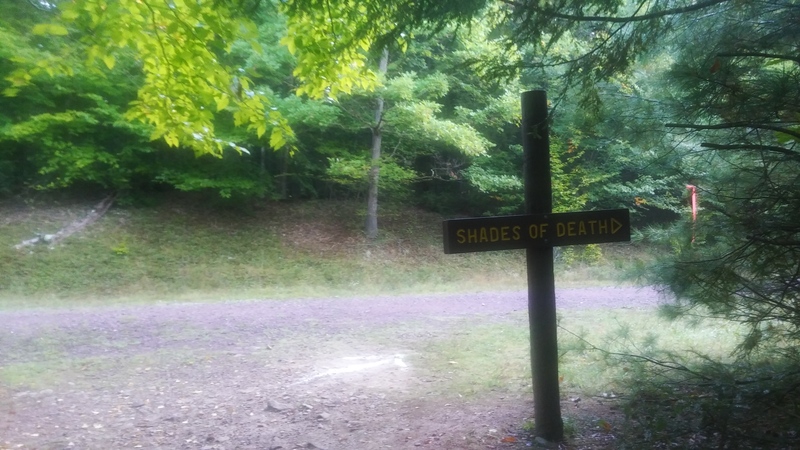 Shades of Death trail. 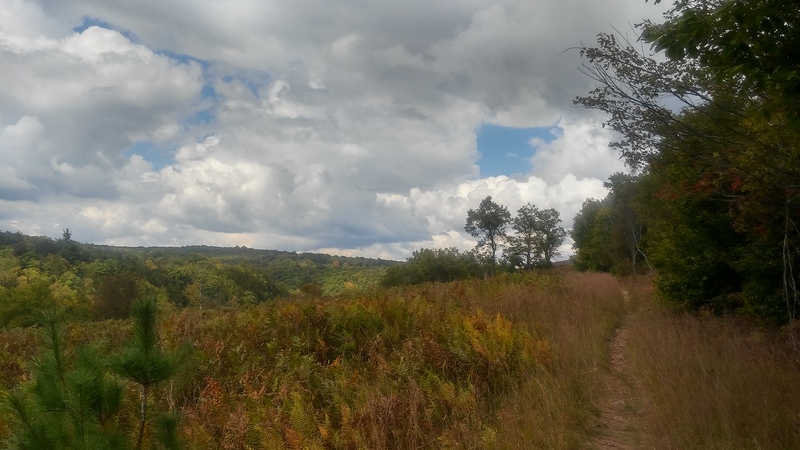 I was fearing something fairly nasty (this is PA afterall), however the person who named this trail is probably the type of person who calls their chihuahua Cujo. It was moderately technical with lots of roots, however there were worse sections of trail elsewhere. This leads you back to the starting area, which I arrived at after 2 hours forty minutes. I made a brief rummage through my drop bag to grab an Ensure Plus, chugged it, topped up my bottles, and was off. Once you see this sign, the hardest part of the trail is over. The trail goes right by a bunch of restrooms (with showers available for after! ), which I took advantage of briefly. I was pretty excited with my time so far as I started the second “half” of the 50K loop only 10 minutes after the 18 mile race started, which my wife was running. I run at a faster pace than her and figured I would catch up to her at some point. It wasn’t too long after my pit stop that I got a little off trail as I ran through the disc golf course. I stood around trying to figure out which way to go for a minute or so before seeing some other runners behind me heading in a different direction. There seemed to be a lot of people going off trail during the race, however I thought it was an adequately marked course. My only caution is that while the turns are well marked, there typically wasn’t a lot of confidence ribbons in the quarter or half mile after a turn so you needed to make sure you were taking the right turn each time. Lots of smooth, easy running ahead. The second loop is much easier than the first. There are lots of gentle inclines and descents that are extremely runnable for the first lap. I ran by the tent campsite where we stayed the prior night and it was right after here that I started passing the 18 milers. The first aid station is about 3 miles in just after you cross under the Northeast Extension of the turnpike. They had started cooking (bacon soup it turns out), however it wouldn’t be ready until I was back through again. There’s a longish fire road after here and then you make a left onto a somewhat technical (lots of roots, rocks) and very narrow in spots trail. I was passing the 18 milers fairly steadily through here and kept craning my neck to see if the next one was my wife. Eventually, I caught up to her and we chatted for a couple minutes before I slowly pulled ahead. “Trails” don’t get much more technical than this. Just a hop, skip, and a jump from one rock to the next. It wasn’t too much longer that I reached the boulder field. Oh my goodness. We only ran a couple hundred yard cross section of it, but it was so much fun. If I hadn’t been in the middle of a race, I totally would have retraced my steps and “ran” it a couple more times. Luckily, I would be back this way again so let that thought satisfy me for the time being. The second aid station of the loop was just on the other side. I topped up my bottles and was off in no time at all as normal. The next aid station was about 4 miles away and about half this was some of my least favorite sections of the course. It was still gently rolling and while it wasn’t too technical, the rocks were placed almost exactly the right distance to disrupt any rhythm you hoped to achieve. So it was two walking steps followed by a hop then four running strides only to walk for ten feet then run for five then. . . Well, you get my meaning. You run along here for about a mile after the last aid station. After the third aid station on the 18 mile loop, it’s smooth sailing back to the finish line. Almost. 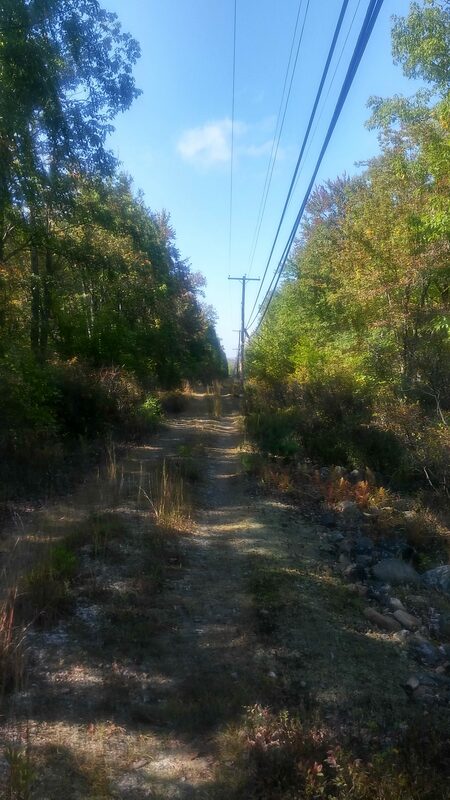 There’s a nice downhill section along phone lines that lasts a good mile plus, however this leads to a mile trail section that is mostly unrunnable. There’s some short ups and downs here on tight single track with some rocks tossed in for good measure. Nothing too bad, however again not really something I could get into a rhythm with. The trail pops out onto a road that is the first of a two mile climb. 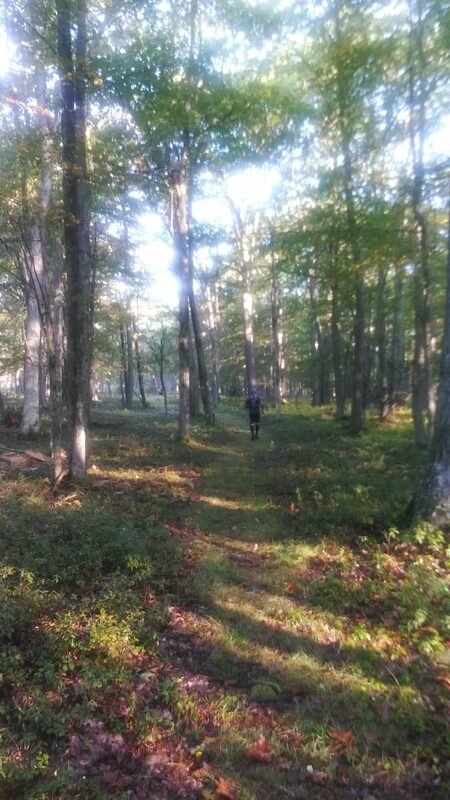 I was hiking this section with another runner when fourth place in the 50k (first place had blown by me about 5 miles earlier at mile 23) comes flying by us with fifth place hot on his heels a couple minutes back. It always amazes me the quality of athletes at the front of the packs as these guys were running strongly up this hill that I was barely able to manage at a 15-16 minute pace. After three-quarters of a mile, you transition onto a trail that goes another mile until you reach the road that takes you back to the start/finish line, which I hit right at 6.5 hours on the nose. This was a good time for me so now I started running some math to see what might be a realistic finish time. I knew I was going to slow down and kinda guessed that an extra hour or 2 minutes/mile seemed like a reasonable target. This would give me a finish time of 14 hours, which was right smack dab in the middle of where my preview post predicted I might finish. It was almost immediately after leaving the start area that I reached my low point for the race. I’m not sure exactly what caused it, but think it was some combination of low calories, slight dehydration, and the fact I still had to run this darn loop again. My guess it was 50% some combination of the first two and mostly the last. Looped courses have much to recommend them (typically shorter distances between snack bars, increased familiarity with the trails on later loops), however the mental will needed to leave the start line for the second (or third) time can be immense at times. I mean your car (and the cold 6 pack in the trunk) is right there! Toss in the fact that I wasn’t even halfway done from a time standpoint and it was getting hotter out and did I mention I had cold Victory Brewing beer in a cooler? You do have a nice view at the top of the climb in between the first 2 snack bars. Where was I? Right. Mentally, I had started to slip, but the one nice thing about moving quickly through aid stations is I don’t give myself much time to consider any alternative (like dropping) before I’m already a half mile down the trail. And by that point, it’s usually easier just to keep going. I was running around a couple others in through here, but since I was in a low point I let them pass and head up the trail ahead of me. And all those gentle inclines I was running up that morning in the dark? Totally walking them now. I didn’t quite run the math to figure out if I could walk it in at this point as I was still only about 2 minutes/mile slower than the first loop, but I did start to question why I run these things. It had been a couple races since I’ve been in this place and I forgot that the answer to the question can’t be found on the trails during the race, but only afterwards upon reflection. So I did what any good ultra-runner does and started problem solving. I figured I was low on calories so at the next aid station I grabbed a fist full of gummy bears and ate them as I moseyed down the trail. I also realized that I was very thirsty which led me to chugging my water. I didn’t have much taste for the Gatorade so left that to drink after my water was gone. While it wasn’t all that hot out, I probably drank about 30oz+ in the 75-80 minutes it took me to get back to the aid station by the wooden bridge. In addition to another large handful of gummy bears, I also had some orange slices. Both of these would provide the vast majority of my calories for the rest of the race outside of the Ensure Plus I grabbed from my drop bag. There was a huge variety of scenery to distract you from any discomfort you may be feeling. I was riding a decent high once I got back to the start/finish line for the next to last time. I grabbed a clean bottle from my bag and filled it with Coke (no Mountain Dew at this one) and my headlamp. I kept waffling back and forth on whether I would need it. It was 2:45pm and a 4.5 hour 18 mile loop would get me back about 15 minutes before it got need-your-headlamp dark out. I thought this was possible, however I wasn’t setting the course on fire at this point and who knows what the next 18 miles would bring. Sure it was the easier of the two loops, however it was still quite a distance and it’s always better to be safe than sorry. You can totally walk the last 3 miles in the dark, but why bother risking it when the cost is only a couple extra ounces in your pack? The last 18 miles flew by rather quickly. I kept leapfrogging with three other runners for most of the miles. This tends to happen as runners get relatively quicker and slower depending on when they’re taking their nutrition. At the first aid station, I stumbled upon the trick of taking a bit more gummy bears along with me and eating 4-5 each mile. I’m pretty sure I’ve done this before. Hopefully, I’ll eventually remember all my “tricks” and use them in each race. Until then I guess I’ll keep reinventing the wheel each time I pin on a bib. 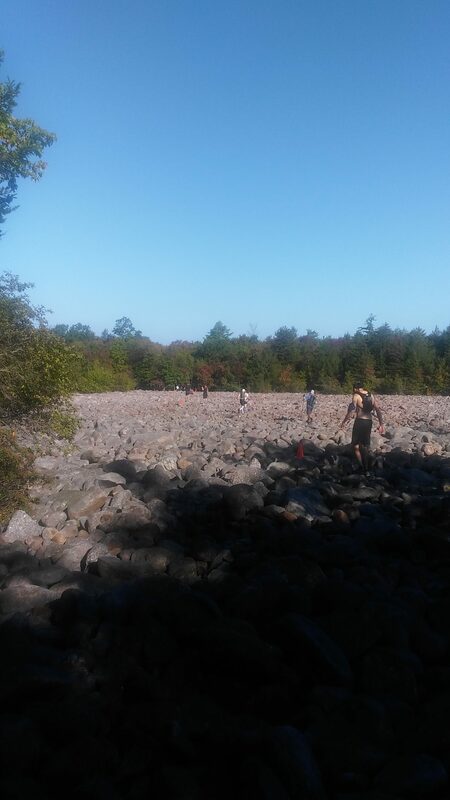 The boulder field was even more fun the second time across. When I reached it, I had just passed one runner and there were several others halfway across. I absolutely flew over them and passed two others in the process. One of them ended up passing me back before the end, but I was definitely stronger over the last 10 miles than I feared I would be. I gave a little cheer as I reached the last technical trail section since I knew it was the last hard little part. Then I gave another little cheer as I reached the road. I was stoked to see it was 6:20pm and knew I could definitely cover the last 3 miles before I would need a light. Turns out it was closer to 2.75 miles and my pace was so good that I was able to finish inside 14 hours (13:58). While I ended up right about where I thought I would be, the path that got me there was not as I expected. Which I guess is a pretty accurate metaphor for life when you think about it. 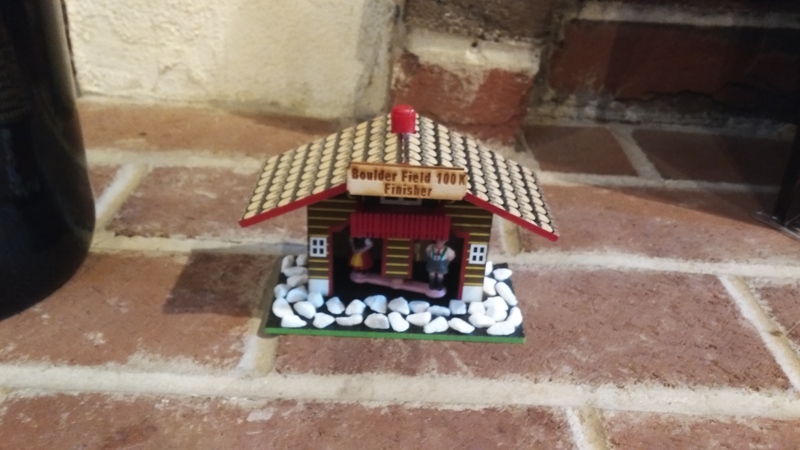 100K finisher’s award was pretty unique. Early on in the race, I was running with a couple other guys and the topic of conversation somehow got onto age groups. 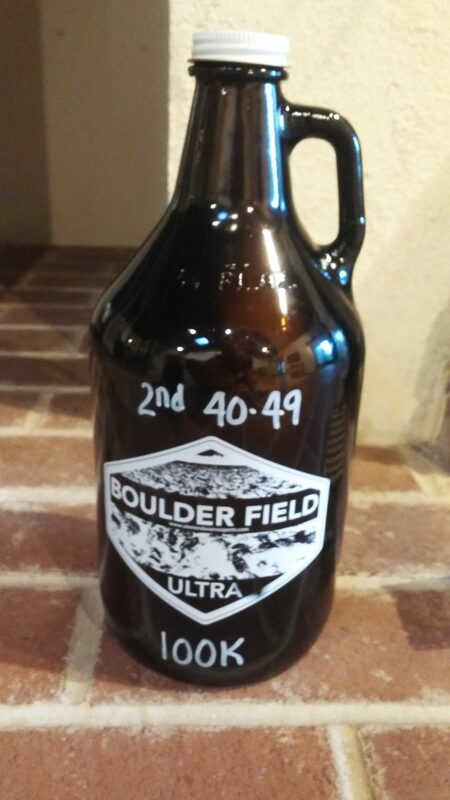 We all commented on how tough the M40-49 age group was, which we all happened to be in. I mentioned how I had won my age group once (was actually 3rd, but first 2 won outright and was first master’s) and never thought I would end up placing again. As I crossed the finish line, the RD asked my age. I told him 45 and he reaches over and grabs me the award for 2nd place in my age group of 8. I was very surprised as I didn’t think 14 hours on that course was all great a time as demonstrated by me only being 20th of 30 finishers. I guess you never really know what can happen when the sample size is small enough. If you’re looking for a 50K or 100K in PA, you should definitely consider signing up for this race. While my watch measured it a little short (59.78 miles), I have no doubt that it was the full distance advertised. Despite the number of times I used the word “technical” in this race report, the trails were on the easier side of things. Total elevation gain was 6600 feet or about 110 feet per mile, however it felt like less than that. It was also among the most varied courses with each mile a little different than the one before. I may not be back next year, but I’ll definitely be back to tackle the Boulder Field course at some point in the future.